Rodolphe R. Corbiere, 91, died May 3, 2015 in Vermont Respite House, Williston, after a long battle with congestive heart failure. Rodolphe was known lovingly as “Dove” to his family and “Rudy” to his friends. He was born on March 10, 1924, the son of Ovila and Virginia (LaBelle) Corbiere. 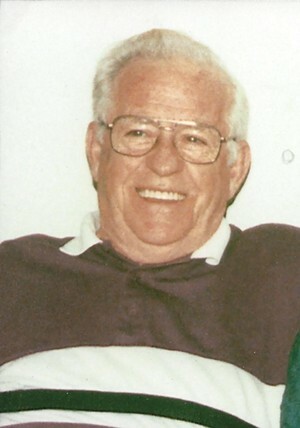 He was a veteran of World War II, serving in the United States Air Corps. He was married in Burlington, VT on September 15, 1945 to his beloved wife of 63 years, Grace (Langlois) Corbiere who predeceased him in 2009. Together they enjoyed raising their family and upon retirement they enjoyed “the good life,” wintering in Florida. Also in retirement he enjoyed doing stained glass. He made many beautiful pieces which he freely shared with family and friends who will enjoy them in their homes for many years. Dove worked most of his life at the University of Vermont in the maintenance department and as a roofer. The gold dome of Ira Allen Chapel was one of his accomplishments. He was a very resourceful man as well as being an accomplished wood worker, making many pieces of furniture for his home. He enjoyed golfing and spending time with his family. Dove is survived by his two daughters and their husbands, Debra, his constant companion and caretaker, and her husband Kenneth Chevrette of Essex Junction, his daughter Judy, his “baby” girl, and her husband Robert Fulton, Sr. of Dixfield, Maine; his daughter-in-law Carlene Corbiere; seven grandchildren and spouses, Sherrie and Scott Major, Kristy and Adam Winters, Kimberly and James Loiselle, Paul Chevrette and his fiancé Erin Johnson, Robert Fulton Jr, Thomas and Tiffany Fulton, and Jessica and William Baransky; 14 great grandchildren and one great-great grandson. Along with his wife and parents he was predeceased by his beloved son Gary Corbiere and all five of his brothers and sisters. A Mass of Christian Burial will be held Monday May 11, 2015 at 11am at St. John Vinney Catholic Church. Arrangements are under the care and direction of LaVigne Funeral Home and Cremation Service. Donations can be made to Vermont Respite House, 99 Allen Brooke Rd. Williston, VT 05495. Online condolences may be shared with the family at lavignefuneralhome.com.